Never heard of Building 15? You’re not alone. Most people walk past the unprepossessing block on the corner of Harris St and Mary Ann St in Ultimo without a second glance. But inside and outside UTS’s newest building, change is happening. Building 15 may not boast a high-profile architect, a show-stopping street presence or even a mark on the map, but it does have a dual identity that has helped it to fly under the radar until now. Known as TAFE Building U until recently, it has been acquired by UTS as part of the Kuring-gai campus relocation project. Building 15 is the latest addition to the UTS City campus. 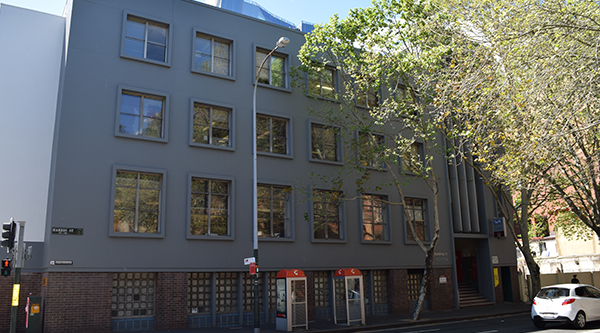 The building is currently jointly tenanted by UTS and TAFE, with UTS progressively occupying the lower two floors of the building. The Hatchery pre-incubator program and other entrepreneurial enterprises are located on level 1, while several UTS creative industries initiatives are currently housed on level 2. A number of upgrades to workspaces throughout the lower floors have taken place in recent months and more plans are on the way for Building 15 so keep an eye out for future updates. Along the Harris St perimeter of Building 15, an old masonry wall is being demolished, part of a plan to improve the outside amenity. The wall of the former car park below the Harris St footpath is also being structurally strengthened, while the stairs leading up to street level are being restored. During the five-week project, a new metal railing fence will replace the solid brick wall, allowing views through to the iconic Dr Chau Chak Wing Building from Harris St for the thousands of pedestrians who use it daily. It is inevitable that noise will occur during the works. Your patience is appreciated – and we promise the result will be well worth the inconvenience. With Building 15’s exterior having recently been painted to enhance its street presence (who could forget the pink!) and other minor improvement works to the adjacent property – a former convenience store – now complete, plans to activate the former car park are being considered. Pop-up retail outlets and entertainment venues are just a couple of the exciting ideas that have been put forward. Watch this space for more information in late 2015. © Copyright UTS - CRICOS Provider No: 00099F - 11 August 2017 07:47 PM. The page is authorised by Director, Marketing and Communication Unit.